As first blog posts go this might be a sombre one to start proceedings but because it’s a new year, a new start and in light of recent news; reading a very poignant but beautiful post from Michael Di Paola courtesy of the Studio North blog on Simon Calderbank’s departure ‘Emotional deposit at the Bank of Calders‘ it, for me at least, needed to be written. I also couldn’t think of better post to start my blog. I love Twitfaced I can’t help it, I do. Knowing it’s coming on the Friday is something to look forward to all week. I’m happiest when I’m there as I feel I’ve come home. Although I must say the official @twitfacedevents and #twitfaced tweets do help. I’ve even got a lovely trophy to prove I’m a fan, awarded to me at Twitfaced 5 in recognition of my long serving devotion to the cause. I remember the first one they staged back in the day at Panacea, a step into the unknown based around an excuse for a load of people from the creative world to get together and a have a drink. All organised via Twitter. There we are 90 of us stood early doors at Panacea. My abiding memory of that night was the huge slap reality gave me when a well to do 50 year old walked in with a gaggle of young ladies (think I counted 5 on each arm) and took residence in the adjacent booth where they slowly got to the know each other and the 3 bottles of champagne a little better. Over the previous 4 incarnations we’ve had visits to Revolution, The Slug and Lettuce, that bar in Castlefield that Mick used to own and the recent personal favourite Lock 91. Mark Cadwaladar you will never be forgotten. The ever present Wheel of Booze and Tweet Wall have been with us every step of the way and I’ve even challenged another Hall of Famer to a game of Twister before tweeting my attraction to a lady in a fluffy yellow jumper via the wall. “Jumpergate” is now etched into Twitfaced folk law. 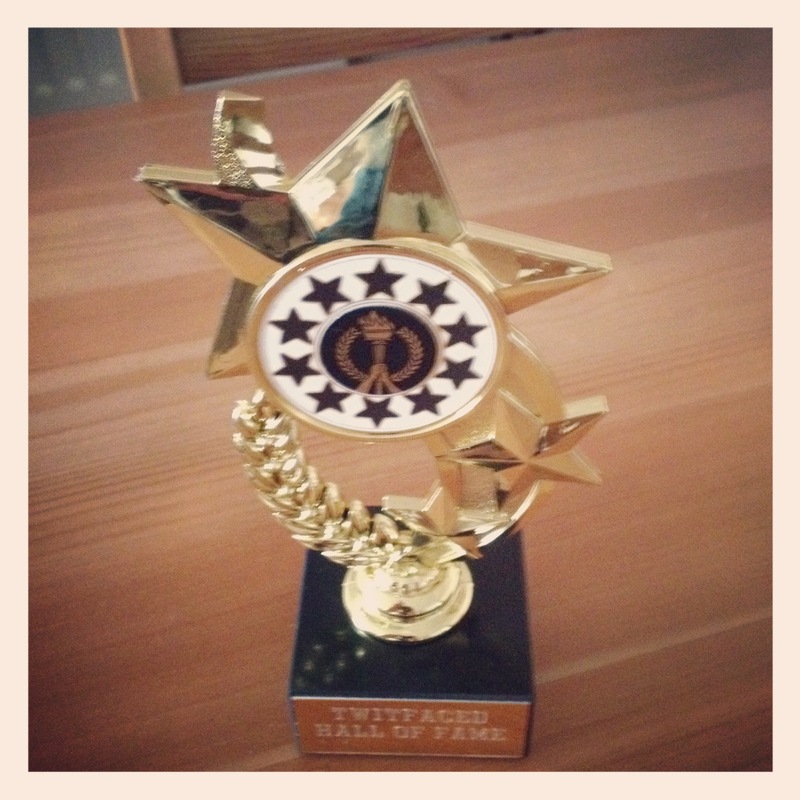 To be honest I wasn’t expecting a trophy, I’m very flattered if a little embarrassed. If truth to be told I’d be there if there was no trophy, there was no prize and there was no award. The reason I go is because of the actual event, for the people and the people you get to meet. And I like to think those that go and come back do so because of Simon and Michael. That little trophy means more than a memory to me. I look at it and see two people that created something they both truly believed in and weren’t afraid to get out there and do it. It’s original because it doesn’t need to try too hard and that’s the beauty of it. Simplistic fun with a dose of good natured northern humour. Who can forget Jimmy Saville’s guest appearance at Twitfaced 4 an amazing performance considering the context. In an industry that can be a tad ‘up itself’ at times, here’s 2 people, an agency and event that isn’t afraid to say who we are, warts and all. Having seen all 4 in action I’m pleased to say it’s an attribute that goes to the heart of their respective brands. I’d like to think those meetings at Studio North which focused on new business concentrated on the right type of clients and not how many. They spoke about fit and values and going about that prospective client courtship in a way that encouraged interest, showcased relevance and a want to know more as opposed to phoning numbers and ticking them off a list. From my experience it takes a lot to stand apart and be as honest, upfront and transparent as that but as Michael mentioned in his post in these social times it’s needed. Your real audience will always know when you’re being real to yourselves and true to them. 350 at the last count. This is what that little trophy stands for to me at least and I’m happy to accept it from 2 people that embody it. I’m also happy to say I know Simon Calderbank and Michael Di Paola a little and many ways I’ve got to know them a little better through their own event. I’d imagine Twitfaced 6 is in the planning stages and I expect it will try to raise the bar it’s set itself. I also hope Simon and Michael will be present together, banging the drum and leading us a merry dance through the evenings proceedings.